Aside from being located in stunning Northamptonshire countryside, The Barns at Hunsbury Hill’s uniqueness is largely due to its unusual history. The stunning 13 acres on which The Barns now stands began life as one of the medieval common fields of Hardingstone Parish. When agriculture began to change in the mid-18th century, much of these open-field Midland parishes were ‘enclosed’ for pastoral farming. When Edward Bouverie purchased Delapre Abbey and the manor of Hardingstone in 1764, he was one of the first to begin enclosing the open-fields in Northamptonshire, doing so around 1765 and by 1770 he had built a new model farm on Hunsbury Hill. Until the 19th century, farms usually grew organically over time with buildings being added as needed, but the revolutionary new farm built by Edward Bouverie on Hunsbury Hill was designed, planned and built in its entirety. The octagonal design, built around a courtyard was one not yet seen, and each building was located for maximum efficiency and convenience. With the two large barns, one for corn and one for hay, it is thought that the farm was initially intended for mixed farming. However, with the addition before 1810 of two long feeding sheds, it is thought that the fattening up of livestock ready for the nearby Northampton market became the focus, perhaps due to the rapidly growing population. Documentation shows that for the first 100 years the same family named Shaw were tenants on the farm, which may be why apart from some of the ancillary buildings being replaced or altered as farming methods improved, much of the farmstead has survived. In the late 1870’s farming on Hunsbury Hill ceased for a time due to the ironstone extraction that took place across the entire site. Although the topsoil and subsoil were replaced after excavation, and the ground levelled out, the soil was no longer in good enough condition for arable farming. When farming began again at the beginning of the 20th century, it was with livestock, predominantly sheep. 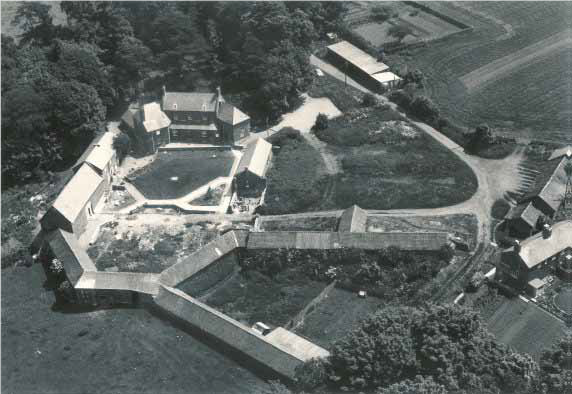 This is an aerial view of the Hunsbury Hill Centre from 1981 prior to the housing development and Danes Camp dual carriageway work that took place later in the 80’s. Now owned by the charity Northamptonshire ACRE (Action with Communities in Rural England) The Barns have been sympathetically restored for modern use and still retain many of their features such as exposed beams, stonework and wooden floors. They make a truly stunning and charming venue for not only weddings, but many other events and also make a unique setting for corporate events.